1. Tail up, tush out.ready to take on the world. 2. She's friendly and has a good FLUFFTITUDE. 3. You need to own your FLUFFTITUDE. 4. There's been a change in her FLUFFTITUDE since her grooming. 5. She is BICHON you know. She has a real FLUFFTITUDE. 6. I suggest you get some FLUFFTITUDE and shape up. 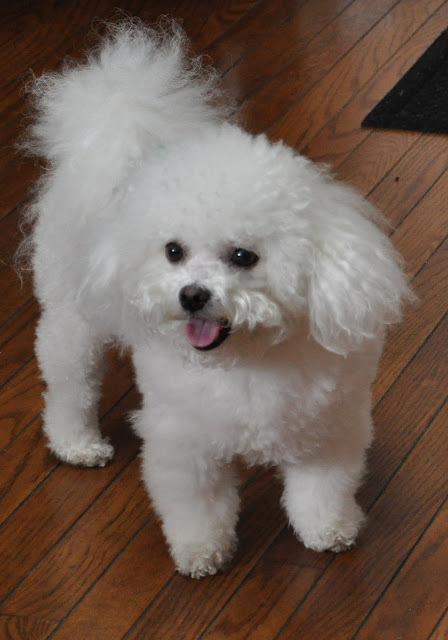 French, from Italian attitudine, literally, aptitude, from Late Latin aptitudin-, aptitudo fitness — more at aptitude and FLUFF as in Bichon tail. Synonyms: posture, carriage, poise, stance, station, but with hump and tail behind it. add it to your dictionary, use it proudly with..... FLUFFTITUDE!!!! I love it! I think I have fluffitude too! Maybe this word will spread and EVERYONE will be using it. I am currently in full-coated fluffitude -- mostly because mama hasn't had time to give me a haircut lately!